Gotta have a Dole Whip! 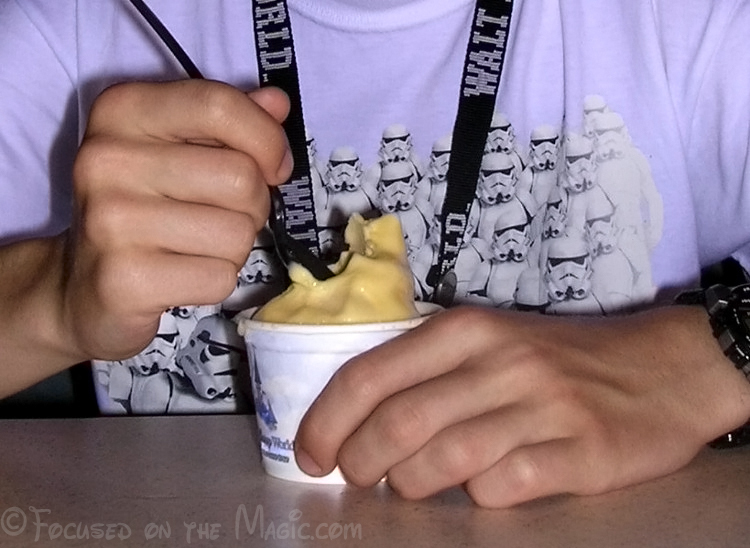 | Focused on the Magic : Gotta have a Dole Whip! Gotta have a Dole Whip! Just the other day I had a major craving for one. To satisfy the craving I had a Healthy Choice bar which is no substitute for a Dole Whip. Speaking of the real thing. I know there are recipes for making Dole Whips at home and there are home machines that can whip them up for you. Maybe it's just me but I'd rather save my Dole Whip indulgences for times when I'm in Disney World. There are just some things-that-should-stay-in-Disney. You can find Dole Whips at The Aloha Isle in The Magic Kingdom's Adventureland. They serve up pineapple, vanilla, chocolate and swirl for $2.89 or 1 snack credit on the DDP. The Wilderness Lodge has self serve machines but only vanilla or chocolate. 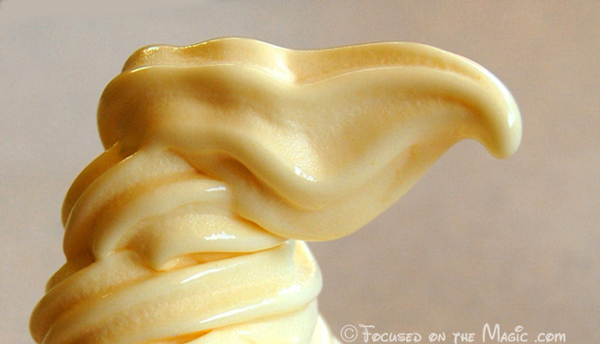 Or, you can find a self serve Dole Whip at Captain Cook's counter service restaurant in The Polynesian Resort's. Dole Whips are refreshing, have a healthy dose of vitamin C, they're fat free, cholesterol free, lactose free and only 80 calories for a 1/2 cup serving. Not a lot of calories for a dessert. Walking around the park would burn that off. 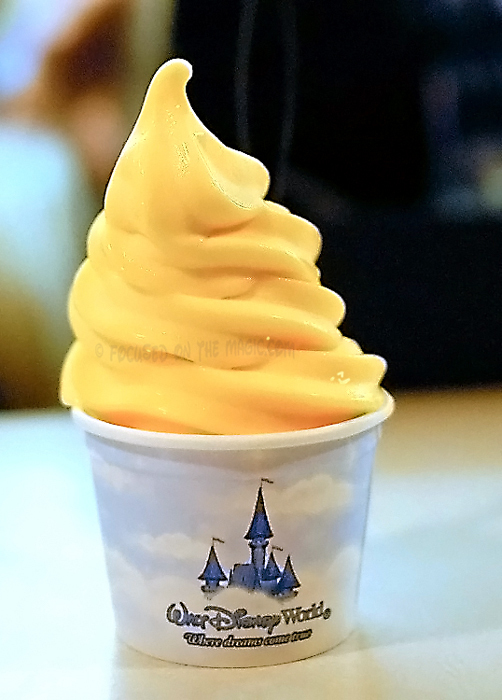 There's nothing like having a Dole Whip late at night after the fireworks during EMH. I'll pick a quiet table in the corner and just relax thinking back on the days activities. Speaking of traditions.We have a tradition of having a Dole Whip for Bawb each trip. It started In May of 2008 when I attended a memorial/meet for the late Bob Varley a wonderfully funny DIS moderator and DISUnplugged Podcaster. That night I went to the MK and had a Dole Whip in his honor, took a pic and posted it on the DISboard thread, A Dole Whip for Bawb. It's one way of remembering and paying tribute to a great guy who is sorely missed. A dole whip again! Everyone loves this! lol! Now you REALLY have me craving one. Glad it's only 22 days until my next trip! YUM! ashamed to say I've never tried a dole whip. I went to get one once, but the chocolate won for this chocoholic!! I agree...they're good. But frankly I think they need a shot of Malibu rum! Lucinda, that's a brilliant idea!! I completely agree with you on letting the Dole Whip experience stay at Disney. I can't imagine enjoying it any other way or any other place.